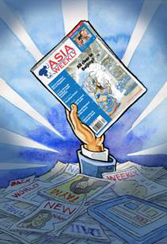 Jasper Becker established Asia Weekly, a Hong Kong-based news magazine on Asia , in 2005 which had a print run of 20,000 until it closed at the end of 2008. 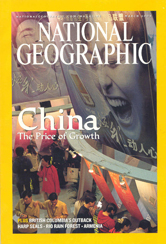 The magazine won a number of awards for design and content. He has written commentaries to the International Herald Tribune, The New York Times, The Washington Post, The Spectator, The New Republic, The Christian Science Monitor, The Irish Times, The Wall Street Journal, The Australian Financial Review and The Globe and Mail. And has contributed features for Vanity Fair, National Geographic, Marie Claire, Prospect and other magazines. Rogue Regime: Kim Jong Il and the Looming Threat of North Korea was runner up for the 2006 Helen Bernstein Book Award for Excellence in Journalism. The introduction won the Book of the Year Award from the Academy of Political Science (2005) Hungry Ghosts, the first account of China ’s Great Leap Forward famine (1958-62) won the 4th PIOOM Foundation Award for a work on major human rights abuses. Articles on North Korea won the Kilpatrick Award for Human Rights and Children and coverage of the Falun Gong crackdown won the Hong Kong Human Rights Press Award. Journalism. 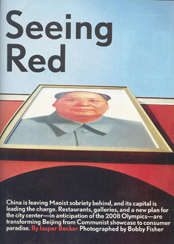 From 2002-2005, he was the China correspondent for The Independent. Between 1995 to May 2002, he was Beijing Bureau Chief of Hong Kong ’s English-language South China Morning Post (SCMP). Jasper Becker started his career in Brussels and worked for the Associated Press in Geneva and Frankfurt . He joined The Guardian and reported from Beijing 1985 to 1989 and notably covering the first pro-independence riots in Lhasa, the pro-democracy movement in South Korea, Taiwan's democracy movement and reporting from North Korea, Vietnam, Mongolia and Japan. After the 1989 Tiananmen demonstrations for which the paper nominated him as foreign correspondent of the year, he returned to London . Several years later he left The Guardian and joined the BBC World Service as the Asian Affairs Analyst. He travelled widely throughout the former Soviet Union and wrote The Lost Country on the fate of the Mongols. Education: A British citizen, born London 19 May 1956, married with three children aged four to eleven. After attending Mill Hill School , he obtained a BA degree at Goldsmith's College in the University of London . He also studied at the Ludwig-Maximilians University in Munich and later obtained a post-graduate Diploma in Modern Chinese from the University of London . In addition to Chinese, he speaks French and German.